Support Resources for Organizing and Social Change! Subscribe to our mailing list? Leave your email! Did you know that for only $10 per month - Resources for Organizing and Social Change (ROSC) can sponsor about 5 low-income people at our annual Changing Maine Gathering? These gatherings are an annual, short and sweet one-day series of talks and workshops for grassroots activists. Changing Maine gatherings have been happening in Maine for over two decades, and they are a great place for activists and organizers to plug into ongoing campaigns and network with others working for social change. Every year offers a different theme. Fees are always sliding scale starting at $0, and always include food! We had the privilege of partnering with For Us, By Us to organize the event. For Us, By Us is a fundraising engine, and a flexible fund to build capacity for people of color (PoC)-led initiatives in Maine. We know the importance of following the leadership of PoC, so we made sure to use an organizing model that centered PoC leadership while white ROSC members took a support role. For Us, By Us created all content for the gathering, and ROSC took care of fundraising, catering, registration, securing a space for the event, and making sure workshop presenters got paid, among other logistics work. This model was a powerful way for ROSC to center the work of PoC organizers and to use ROSC resources to support PoC-led work. We were able to fund raise enough money for the event, that after expenses were covered for it, the remaining $5,000 of that money went directly to For Us, By Us. We wanted to make sure For Us, By Us was paid for their organizing work, and we also saw the $5,000 as a part of the reparations work ROSC thinks all organizations with a lot of white folks in their base should be doing. 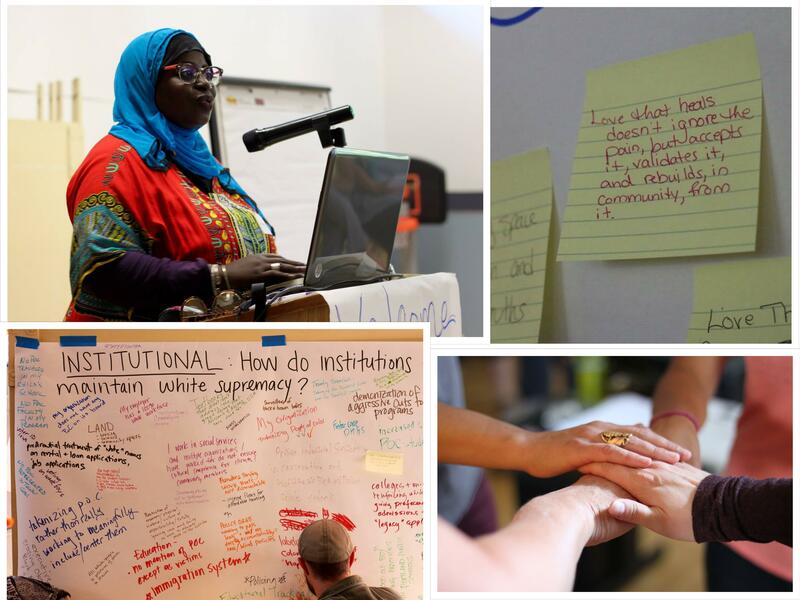 Changing Maine for Racial Justice was able to have a PoC only track of workshops. We’ve heard from our fellow PoC organizers that there aren’t enough opportunities to gather in PoC exclusive spaces in Maine, so we were very excited to support this space. Being able to gather in a space with people who share similar identities is crucial for many directly impacted people’s mental health whether they are women, trans folks, PoC, or Muslim, for instance. It’s also important for people with similar identities to be able to gather, strategize, and movement build within the context of their identities. Finally, white attendees and others who wanted to join the workshops for white folks were able to attend a full day of training based on what For Us, By Us organizers thought was important for them to learn. This was an amazing opportunity for white people to absorb information that was informed by what PoC organizers see as needed education in Maine. Changing Maine for Racial Justice was so successful that we’re going to be hosting a part two of the event as our Changing Maine in 2019. We hope Changing Maine 2019 is more focused on tangible movement building and action steps. Stay tuned!! ROSC is a small (but effective) organization, and we’re local, so you can feel really good about supporting us. And you won’t see us sending you fancy brochures or gifts to try and schmooze your support. Any money you give us goes directly to the work. When deciding how much you’d like to give to ROSC, we ask you to take Class Solidarity into account. Class refers to where you and your family fit into the world regarding finances (for example: poor, working class, middle class, wealthy). ROSC does everything on a shoestring budget so we can make sure we are accessible to all. If you and your family are people who can pay more to support ROSC so others can pay less, please consider doing so. If you do so, you will be taking an action of solidarity and making ROSC more accessible for people who cannot afford to pay much. If you aren't sure what your class background is, you can check out this resource on class. Figuring out your class background can be difficult. Remember, you can be of a mixed class background. ROSC is almost exclusively supported by small, personal donations, so we’re not only a truly grassroots organization, we can't do what we do without help from people like you! Will you help us continue to build a more active, grassroots organizing community in Maine? ROSC is a 501(c)3, tax exempt organization. Our EIN, if needed, is 01-0353747. No goods or services were provided by Resources for Organizing and Social Change in exchange or in return for this donation. Sass, Excellent letter! Really captures our world right now as well as the much needed solutions. Keep up the great work!